Beautiful, young looking skin is a goal we all want to achieve; but it can be easier said than done. There are many factors that go into the health of your skin, and you will have to pay attention to each if you want your skin looking its best. Everyone knows that smoking is bad for your lungs, but you may be surprised to hear that it is also damaging to your skin. Research has shown that smoking contributes to wrinkles and can make your skin look older. Not only does smoking deplete the skin of oxygen and nutrients, but it also reduces the skins elasticity. Has your skin ever broken out when you were stressing out about a test or a job interview? That’s because stress can have a number of adverse health effects, including its impact on your skin. Stress increases the body’s production of hormones that make skin oily. It also decreases the body’s ability to fight off bacteria that causes acne. There are many things you can do to keep your stress in check. You may want to consider yoga, exercise, or a massage. In small doses, spending time in the sun can be valuable to your skin because it exposes you to Vitamin D. Unfortunately, too much exposure to the sun can cause wrinkles, age spots, and can increase the risk of cancer. It is highly recommended that you use a sunscreen (SPF 15 or stronger) whenever you go outside. Sunscreen should be reapplied every two hours. Hats, long sleeve shirts, and pants can also help prevent your skin from being exposed to the sun. A healthy diet will improve your overall health and the health of your skin. A diet full of fruits, vegetables, whole grains, and proteins will have your skin looking its best. Nuts and fish are especially good for cleaning out the bad oils from your body. Cutting down on soda and candy is highly recommended. Staying hydrated is also pivotal to your skin’s health. Water helps clear toxins that cause blemishes. It also helps transport oxygen and nutrients to your skin cells. Ultimately, water prevents dehydration, which can lead to older looking skin. Don’t forget to drink plenty of water. Obviously, cleaning your skin on a regular basis is extremely important. When you wash your skin you remove dirt and bacteria that can lead to breakouts. Remember to wash your skin gently so that you do not aggravate or damage it. You should also avoid using soaps that are too strong so that you do not irritate your skin. Moisturizing your skin is highly recommended because it protects your skin from drying up. It also helps your skin maintain natural moisture levels. It is best to apply moisturizer while your skin is still damp so that it traps the surface moisture into your skin. As I mentioned above, keeping your skin hydrated extremely important for your skin’s health. 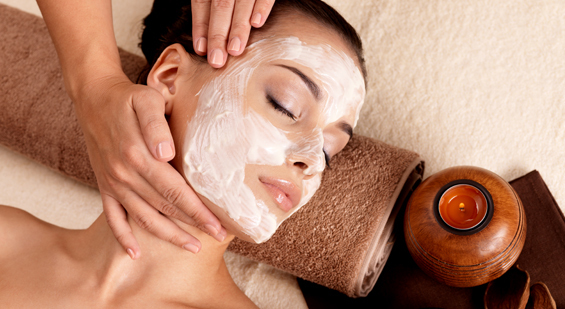 Facial treatments are one of our most popular spa services. Facials manage to deeply clean one’s skin and pores and rejuvenate skin that has begun to age or appear dry. They also can hydrate skin and provide a relaxing and soothing overall experiences. Threads’ facials are customized for your individual needs, whether you want to detoxify, oxygenate, hydrate, purify your skin or reduce puffiness. It’s called Beauty Sleep for a reason. Getting enough quality sleep every night is essential for healthy skin. While you are sleeping, your skin and entire body rests and repairs itself. If you are not getting enough sleep, you are putting extra stress on your body which can lead to breakouts and other skin issues. Between 6-8 hours of sleep a night is recommended. Also, remember to keep your sheets and pillowcase clean in order to avoid a buildup of grease and oil that can irritate your skin. Exfoliating your skin can improve the results of your skin care routine. You can use a face scrub with round beads to gently scrub off dead skin cells and expose healthier skin underneath it. This process can help prevent pores from becoming clogged. Exfoliation should only be done once or twice a week to prevent irritation. Wearing makeup can block your pores and limit your skin’s contact with oxygen. This can lead to skin irritation and breakouts. Asking someone to not wear makeup is too much to ask, but people should be aware that it can damage the skin. Minimizing the amount of makeup you wear will limit irritation. Remember to properly remove makeup before you go to sleep. Keeping makeup on overnight can have devastating effects on your skin. Not only will regular exercise keep you healthy and strong, but it can also do wonders for your skin. When you exercise you increase the blood circulation throughout your body, this leads to oxygen and nutrients being carried to skin cells. Exercise allows you to improve the health of your heart, lungs, and skin all at the same time! Be sure to wash properly after exercise so you do not let sweat sit on your skin. Following these ten tips will not be easy, but it will be worth the effort. Taking proper care of your skin is a vital step in looking healthy and youthful. For more information or help regarding your skin health, stop by Threads.